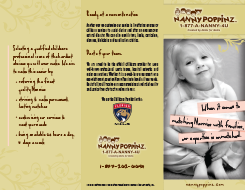 If you are interested in a successful career as a Nanny while making a difference in the lives of Florida families, then Nanny Poppinz has the job for you! Since 1992, Nanny Poppinz has helped thousands of Nannies find jobs with families who appreciate true quality childcare. At Nanny Poppinz, we only refer the highest quality Nannies to families. That's why we personally interview our Nannies before sending them to meet a family. As a Nanny Poppinz Nanny, you will have relevant childcare experience, be legal to work and will have passed a detailed background check which includes a computer (ie Internet presence/digital reputation) check. We also want to make sure that you have the necessary skills in the event of a childcare emergency. That is why we require each Nanny to be CPR, First Aid and AED trained. But at Nanny Poppinz, we don't pass the cost of training on to you. Nanny Poppinz cares about our Nannies and wants to help find a job that is perfectly suited for you. Let Nanny Poppinz help you find your perfect family match today! To get started, click on the 'Nannies Click Here' link to complete your application. Additional Requirements:: Looking for a full time nanny for 1week while husband and I are away on business. Kids will be 22 months and 4/5 weeks. Is this something you offer? NANNY WILL NEED A CAR TO TRANSPORT OLDER CHILD TO & FROM DAYCARE & MUST HAVE INFANT EXPERIENCE WANTS NANNY TO BE 25YRS OR OLDER!